Just as language interpreters put unfamiliar words into terms you understand, so too do park interpreters put concepts concerning our natural and cultural worlds into terms that are meaningful to you. Park interpretation seeks to protect your parks by fostering an awareness and understanding of California's state parks in an enjoyable and relevant manner. The interpreters of California State Parks welcome you to this portion of the web site. We hope that we can provide you with an enjoyable opportunity to become aware of the many interpretive activities available in California's state parks. The six main areas of this section are described below. Choose one of these links to find out more about interpretive activities in California's state parks. If you need more information, please contact us through the information provided in the right hand column of this page. The Park Interpretive Programs section provides information concerning what programs are available on-line and in-person. California State Parks perform a wide variety of programs throughout the state, ranging from wildflower hikes in the desert to campfire programs in the north coast redwoods. This section will help you discover what programs fit your needs. 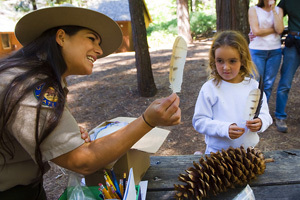 The For Kids section provides Junior Ranger and Litter Getter Program information, as well as activities for kids that deal with culture and history, science and nature, and other fun topics. The For Schools section supplies teachers with information concerning park field trips, provides materials for the classroom, supplies downloadable teachers guides, and offers lesson plans relating park information with California Academic Content Standards. The PORTS (Parks Online Resources for Teachers and Students)web site is designed to further the mission of California State Parks and to augment the teaching of academic content standards in California's public schools. PORTS uses California's K-12 High-Speed Network (HSN) to deliver units of study to classrooms around the state. The How You Can Help section is where you can learn about park volunteers, cooperating associations and supporting organizations. Volunteers are essential and perform myriad functions in today's parks. Cooperating associations raise the funds that make many interpretive and educational programs possible and work in many ways to support the mission of California State Parks. The Resources and Tools section is where we share resources with park staff and with other interpreters around the world. Our informational inserts for park visitors, training schedules, manuals, professional papers, interpretive newsletters, equipment reviews, and other materials are found in this section. The next Regional Rendezvouz will be held on Sunday, October 28, 2018 at the Miners Foundry in Nevada City for the Sierra Bioregion. For more information check the California Naturalist website via the link below. California Naturalists had a Regional Rendezvouz on October 8, 2017 at Pepperwood Preserve in Sonoma County for the North Coast and Bay-Delta Bioregions. The second California Naturalist Conference was held in September 2016. This conference is at the heart of the newly forming statewide network of naturalists, stewards, environmental educators and interpreters. For more information on the University of California's California Naturalist program, visit http://ucanr.edu/sites/UCCNP/.